Is Pudding Gluten Free ? Is pudding gluten free ? And just how sure can you be of the store bought variety ? People will celiac disease or non-celiac gluten sensitivities may find it difficult to avoid gluten and satisfy some of their cravings at the same time, but those people shouldn’t have to miss out. While there are a great number of gluten-free snack alternatives available today, some snacks can be eaten just as they are . The simple answer about pudding is that it’s gluten-free and safe to eat, but it won’t hurt to take a closer look and find out when pudding may need a second thought. In most cases, instant pudding is, in fact, gluten-free, but it’s always necessary to check the ingredients. 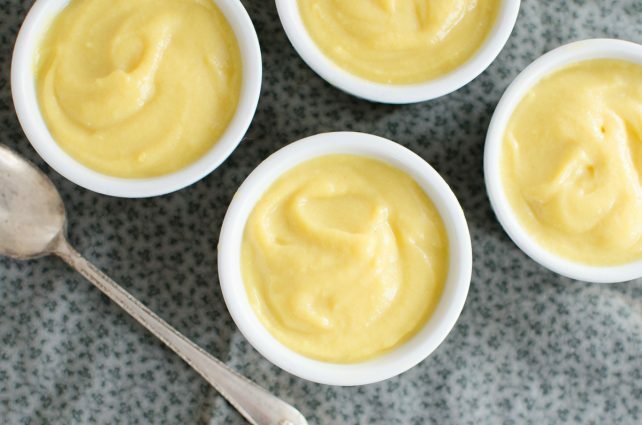 The primary ingredients in instant pudding are sugar, cornstarch, and milk – all of which should be gluten-free. The only downfall here may be that you can’t be 100% sure of the environment in which these products were put together, and although it shouldn’t be an issue, cross-contamination is one way in which a gluten-free product can be ruined. You don’t have to worry about any of the dyes and preservatives added by some companies either, as those are also typically gluten-free. If you see an ingredient that truly strikes you as odd, you can easily do some research on it and even contact the company itself to find out more about their ingredients. When the discussion is about cooked pudding, know that these puddings are typically gluten-free as well, although it will obviously depend on the ingredients the cook used, so if you are purchasing or receiving the pudding from an outside source, make sure you are aware of the ingredients used. While sugar is gluten-free, it is still advised to seek sugar in the purest form. Additionally, cross-contamination can be a concern, as grocery stores typically store the sugar near the flour, and both items are usually found close to each other in the baking aisle. Despite being flour-like, cornstarch is both gluten-free and a more powerful thickener. Plain milk is gluten-free, as is butter. While people with very extreme gluten sensitivities have reported issues with eggs, they should not contain any gluten. It is important to always check the labels on the front and the labels on the back. While pudding may appear gluten-free, it’s always important to check the ingredients just to be sure. In general, food manufacturers seem to enjoy sticking a gluten-free label on their products, given that they actually are gluten free. In an increasingly demanding market, manufacturers need to appeal to more customers, which frequently involves adding such labels or creating a whole gluten-free alternative for their original product. Additionally, grocery stores are beginning to dedicate entire aisles to healthy and natural products, which should include gluten-free options, even for pudding. It’s safe to say that regular pudding could make an excellent snack for those looking to avoid gluten. Additionally, there are a number of “gluten-free” pudding recipes that include healthier ingredients, and given pudding’s sugar content, it could be wise to test out these alternatives.